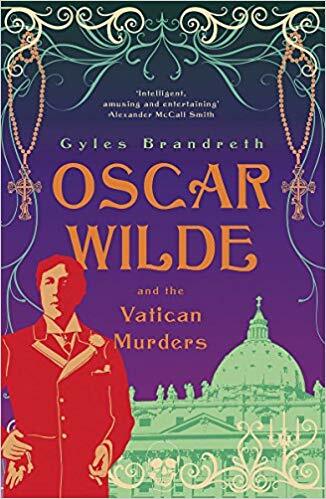 Oscar Wilde makes a triumphant return to sleuthing in the fifth novel in the critically acclaimed historical murder mystery series based on real events, featuring Wilde as the detective aided by his friend Arthur Conan Doyle, and written by the British biographer Gyles Brandreth. A chopped hand, a finger, a lock of hair and a ring are the evidences of the next crime the two friends are going to deal with. The trail leads the intrepid duo to Rome, and to a case that involves miracles as well as murder. Pope Pius IX has just died - these are uncertain times in the Eternal City. To uncover the mystery and discover why the creator of Sherlock Holmes has been summoned in this way, Wilde and Conan Doyle must penetrate the innermost circle of the Catholic Church and expose the deadly secrets of the six men closest to the pope. Let us meet together to find out who is the murderer. Read up to the end of chapter 20, page 282 ”Goodnight, Dr Death.” And then together we will draw our conclusions.